One of the greatest joys of parenting is sharing a selection of your favorite activities such as bike riding with your kids. But if you want to bring your kids on your bike ride, then investing only in the best bike trailer is a must. Some trailer models carry two kids, while others carry only one child. Additionally, all models usually have a specific weight limit so you should be keen not to exceed that limit to ensure safety during use. Towing your child or your gear behind you in a bike trailer is a lot more comfy and safer compared to carrying all that weight and strain on your back. Bicycle trailers are also perfect for transporting bulky items, while baby trailers provide your kid a comfortable resting place. If you are shopping for a bicycle trailer, then you’ve come to the right place. Before we get to the recommendations on the best bike trailers, let’s look at some important tips and considerations for choosing the best bicycle trailer that works for you. There are a few bicycle trailer features that you will need to consider based on your convenience, space and riding style. Whether you are using a bike-mounted trailer or seat, you should ensure that you have a secure harness to restrain your passengers safely. Models designed to be used by two kids should have at least two tackles that the kids can hold onto when riding. There are times when you are not going to be using the bike trailer, so you must ensure that the model you choose is portable and easy to fold away. Some models have fast-release wheels and fast-folding mechanisms to make it easier to store the trailer in small spaces. You will need to choose the right attachment style that fits with your current bike set up. Some bike trailers attach via axle mounts on the bike’s rear axle while others use a frame mount that directly clamps to your bike’s frame. Especially vital to a bicycle trailer is the hitch arm that connects the bike and trailer. This mechanism must have an extra backup, like a strap, to ensure the bike trailer doesn’t break away. Some hitching arms also remain upright even if the bicycle falls while others have useful springs that twist the trailer away from the bike during an accident. You’ll find that most of the bicycle trailers have steel frames, while the expensive models may have an alloy frame, which is a bit lighter. Ensure that you choose a sturdy structure that will protect your child. Some models even offer a perimeter frame or roll cage to provide even better protection during a rollover. If your trailer has steel rims, then you should be cautious about where you store it as they are more vulnerable to rust as compared to aluminum rims. Larger wheels offer a smoother ride in general. Meanwhile, trailers with smaller wheels are more maneuverable. Make sure the tires are also of good quality to ensure that the trailer can roll easily even on rough terrain and over bumps. It is critical that you are visible on the road to other people using the way, to prevent accidents. So, check for rear or side reflectors or reflective strips on your trailer. A well-made, padded seat will provide your child with a more comfy ride. Also, ensure there is sufficient back support and leg room for your child. As always, always ensure your child wears a helmet every time they are riding in the trailer. Most trailers feature a fabric or plastic shield that is designed to protect your kids from road debris and weather elements like rain and wind. Tinted windows can provide sun glare protection while keeping the interior part of the trailer cooler for your kids. Nevertheless, ensure that your child can still get adequate ventilation even when the shield is covering the trailer. Single capacity trailers are more affordable, narrower and lighter, but provide less storage. In contrast, double trailers are wider, heavier and more costly. If you have a growing family and you intend to carry two babies along for the ride, a dual capacity unit with a spacious cabin is your best option. A good suspension ensures a comfortable, smooth ride. For families that intend to use the trailers on smooth pavements then the suspension should not be a huge priority. However, those who want to use the trailers on all terrains should ensure they get a good suspension system as it helps to smoothen out the ride. The Burley Design D’Lite Child Bike Trailer is an outstanding product for both the child inside the trailer and the person pulling it on the bike. It features a lovely, lightweight design, 20-inch wheels that smoothen out rough roads and an excellent hitch that doesn’t transfer motion to your bike. Concerning versatility, this D’Lite child bike trailer is a remarkable biking accessory, with strolling and jogging and other conversions available. The D’Lite comes with a host of impressive security features like the secure five-point harness system and the roll cage. The adjustable sun shade on the front flap of the trailer is flexible and can be adjusted to keep the sun away from your child’s face throughout the day. Additionally, thanks to its large wheels, you will not be affected dramatically by the potholes and rocks in your path. The amply sized interior can also be reconfigured to transport everything from groceries and dogs to your camping gear. This particular bike trailer is one of the most affordable models for buyers seeking a dependable product. It is nimble, and it does an excellent job of protecting its passengers from wind and rain. However, since there is no padding on the seats, it is not recommended for use when riding over long distances. The Cadence features a reasonably aerodynamic and low-profile build that makes it easy to tow around. Hooking it up to your bike takes less than 20 minutes, and this is due to Thule’s innovative ezHitch system. The 20-inch wheels perform well even in rough areas. However, since there is no suspension system here, the ride does feel much more bouncy as compared to the Burley Design D’Lite Child Bike Trailer. If affordability, ease of use and sufficient storage are important considerations for you, then the InStep Quick N EZ Double Bicycle Trailer is a reliable option. It even features an extra wheel and handlebar that allows it to be used as a baby stroller. You’ll have no difficulty steering your kids around as the plastic swivel wheel turns about without lots of effort. The InStep Quick N EZ Double Bicycle Trailer is full of comfort and safety features to ensure your kids are safe as they ride along with you. It has a steel frame for lasting durability and a huge storage basket so that you can bring all the essential supplies for your ride. It is also universally compatible with most bikes, and its 16-inch tires feature molded rims that give the trailer a bit more personality and performance. Overall, with weather and bug protection, user-friendliness and abundant storage space, this bike trailer is worth considering. Take your children along for the ride with the InStep Quick-N-EZ double tow-behind bike trailer carrier. Regardless of whether you want to take a ride across the countryside or just to the local farmer’s market, the Pacific Cycle Schwinn Trailblazer Double Bicycle Trailer is perfectly designed to ensure your children are towing along comfortably and safely. The light and robust frame proves sufficient space for two kids to travel comfortably. This Trailblazer bike trailer features a straightforward design that makes hitching and setting it up very easy. 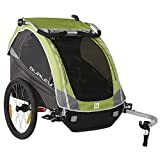 The best thing about this Pacific Cycle Schwinn Trailblazer Double Bicycle Trailer is how straightforward it is with regards to assembly and usage. Once you’ve reached your destination, you’ll be glad to know that it folds away quickly and it does not take up lots of space. In fact, it can be converted into a stroller for your baby, which can be used in any weather thanks to 2-in-1 protective shield that protects from bugs and bad weather. Ventilation is sufficient due to the large back windows, while the side windows allow your child to enjoy the environment during the ride. 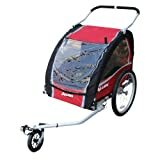 The Schwinn Echo Double Bike Trailer is similar to the InStep Quick trailer with a couple of critical upgrades. Most importantly, it is a bit larger and taller than the InStep trailer. It means your kids will get more leg room and you will also have more rear storage space. The seats have even been better reinforced to provide a comfortable place to relax. The hitch is easy to attach, and it offers a stiff, tight fit, which means narrower turns. It is adequate for regular casual riding, but you probably shouldn’t be making sharp corners with this trailer. The Schwinn rides surprisingly well on its massive 20-inch tires despite not having a suspension in place. Overall, you should stick to slow speeds on smooth pavements, and you will not have any problems with this bicycle trailer. Allen Sports offers a high-quality budget bicycle trailer that is going to serve you very well. This particular trailer has a much stronger construction as compared to Pacific Cycle trailers. Furthermore, it is also much roomier than both the Instep and Schwinn models mentioned above, which makes for an overall perfect ride. The padded seats used here are strong enough to withstand the total weight of two 50 pound kids. These seats also do not suffer from the typical sagging problem that you see with poorly made bike trailers. Even though the foot room is not so much, it is manufactured from rubberized plastic, which reduces the chance of breakage when your kids are climbing inside. As a stroller, this Allen Sports trailer is convenient to use, and you can attach the handlebar easily. The stylish InStep Sync Single Bicycle Trailer is ideal for toting your son or daughter, provided you don’t go above the 40-pound weight capacity. Be it a trail or urban riding; you will find this bike trailer incredibly lightweight for a great ride. Its 16-inch pneumatic tires ensure that your little one gets to enjoy a delightful journey. This single bike trailer folds up to a small size for secure storage in your car trunk and is also quick to assemble and attach to your bike. There is an adjustable rain window or bug screen to keep your child safe. Most kids enjoy the reflective flag that is placed in one side pocket to make it more visible on the road. You can either use the rain or bug screen or roll them if you are riding slowly on a calm day. Overall, this compact and sleek bicycle trailer is worth a look, if not a purchase. Take your child along for the ride with the InStep Sync single tow-behind bike trailer carrier. All the bicycle trailers featured here provide real value to any keen rider. Make sure you keep the above important points when making your selection. Don’t get trailers that are too heavy as they will affect your ability to use them effectively. Most importantly, ensure that the trailer you select is compatible with your bike and is not going to obstruct your brakes, drive train, axles, overall balance or handling ability.